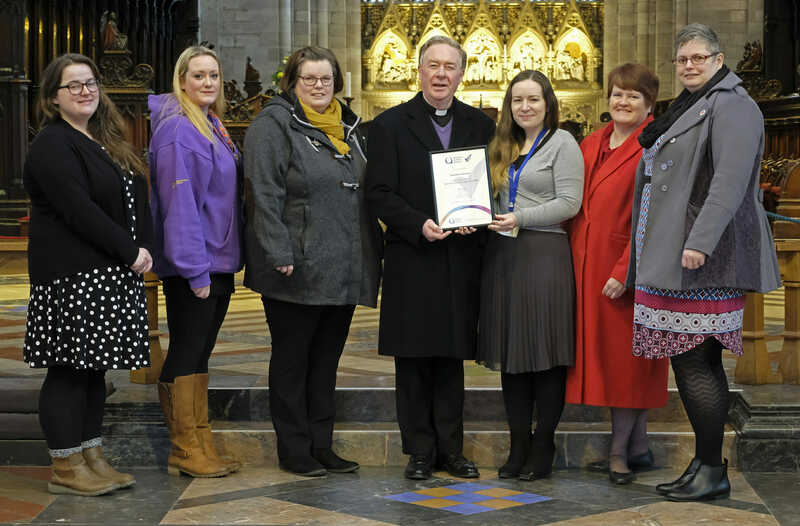 Hereford Cathedral are celebrating the recent news that they have been awarded the Autism Friendly Award from the National Autistic Society. NAS’ Autism Friendly Award champions organisations who commit to making sure that autistic visitors receive the same warm welcome as everybody else. As part of the process Hereford Cathedral have created additional resources including social stories for visitors, implemented ‘Quiet Hours’ for individuals who may struggle with sensory overload and worked with different groups including the local branch of NAS to gain an understanding of the needs of autistic visitors. Hereford Cathedral is the first religious place of worship to receive this award which comes at the end of a six-month process which has focused on improving accessibility for visitors and its community. During the research phase of the Heritage Lottery Funded Eastern Cloisters Project, it became apparent that whilst many people enjoyed visiting the cathedral, some struggled to enjoy their experience for a variety of issues. As a result of these findings, the cathedral undertook a full access audit and appointed an Accessibility Officer to create an action plan to make the necessary improvements. Staff and volunteers are currently in the process of completing accessibility training which encourages them to consider some of the barriers which visitors may face when visiting the cathedral. Daniel Cadey, Autism Friendly Development Manager at the National Autistic Society, said: “Through helping organisations achieve our Autism Friendly Award, we know that it’s often the smallest changes that make the biggest difference. For instance, making sure that staff are aware of and understand hidden conditions like autism, or that there are quieter places for autistic visitors to go if they are feeling overwhelmed. “So we are delighted that Hereford Cathedral has achieved our Autism Friendly Award. Staff and volunteers impressed us with their energy and commitment to improve the experience of the cathedral both for autistic members of the congregation and for visitors. Staff consulted autistic people about the changes they would like to see and the new autism friendly online guide is clear and concise and very easy to use.